Iran's Ayatollah Khamenei: No negotiations with cheating, bullying U.S.
Leader of the Islamic Revolution Ayatollah Seyyed Ali Khamenei says the Islamic Republic will not enter into new negotiations with the United States due to cheating and bullying nature of its government. In a clear reference to US President Donald Trump's withdrawal from a landmark nuclear deal with Iran, called the Joint Comprehensive Plan of Action (JCPOA), the Leader said, "Why should we sit for negotiations with a bullying [and] cheating regime, which negotiates like this?" Elaborating on Trump's offer of direct talks with Iranian officials, Ayatollah Khamenei said, "Of course, they act upon a threadbare and worthless political game in this regard; one of them says [they want negotiations with Iran] without any preconditions, the other one sets preconditions." "Unlike what some people may think in the country, Americans' request for negotiations is nothing new and has been repeated many times during the past 40 years, but has been met with Iran's negative answer. Even then American president, Reagan, who was more powerful than the current ones, in the famous case of McFarlane, sent him secretly to Tehran for negotiations, but he returned without any results 24 hours later." "They have a special formula for negotiations, which must be understood and then this question must be answered that will any wise person enter into negotiations according to this formula?" Ayatollah Khamenei noted. The Leader said "give and take" is the reality of negotiations in customary politics, adding, "Banking on their political, propaganda and financial power, Americans try in every negotiation to thwart any resistance that may prevent realization of their goals." "They firstly clearly set their main goals. Of course, they do not declare all those goals during negotiations, but pursue [realization of] all of them through bargaining during talks. The second point is that Americans do not take one step back from these main goals." The Leader noted, "During negotiations, Americans only give promises using apparently assuring words, but want real concessions from the opposite side and do not accept promises." "We experienced this reality in [the case of] the Joint Comprehensive Plan of Action (JCPOA), and Americans resorted to the same method in negotiations with North Korea." "In any negotiations, if the opposite side refrains from giving real concessions, Americans will launch such a propaganda and media rancor in the world that the other side feels at loss and becomes passive," Ayatollah Khamenei added. Noting that according to the American formula, they give promises during negotiations and breach them afterwards, the Leader mentioned the JCPOA as an example of the result of negotiations with America, adding, "Of course, some red lines, which had been set [by the Leader] were not observed in those [negotiations]." 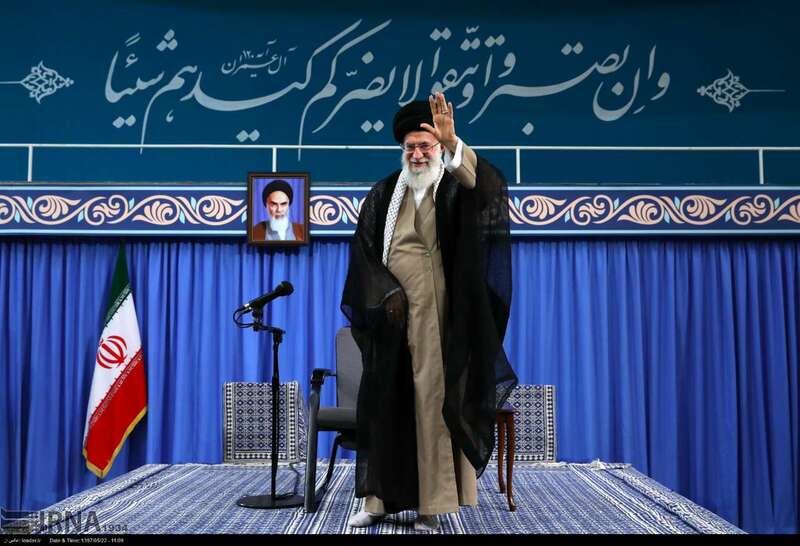 Ayatollah Seyyed Ali Khamenei further stated, "We can only embark on the dangerous game of negotiating with America after we reach the economic and political and cultural power that we have in mind so that its pressures and ballyhoo would not be able to affect us. However, at the present time, negotiations [with the United States] will be certainly to our detriment and is forbidden." Elsewhere in his remarks, the Leader touched on the country's current economic problems, noting that while foreign sanctions hurt Iran's economy, most of the country's economic problems are the result of internal mismanagement. "Economic experts and many officials believe the cause of this issue is not foreign, it's internal. Not that sanctions do not have an impact, but the major impact is related to performances," the Leader told ordinary Iranians at a meeting in Tehran Monday. Iran's national currency has lost much of its value since the beginning of the year, especially after US President Donald Trump abandoned a nuclear deal with Tehran and announced new sanctions on the Islamic Republic. The US president also pledged that the second wave will "ratchet up to yet another level" on November 4, hitting Iran's oil and gas and banking sectors. Rial's devaluation has presented the government of President Hassan Rouhani with possibly the most serious quandary. Ayatollah Khamenei said on Monday the judiciary chief's request is "an important positive step to tackle corruption and those involved in economic corruption." "Some are saying extreme things and claim that all are corrupt and use such descriptions as systematic corruption; that's not the case. True, even minor corruption is too much but extremism is wrong in all fields."